Paperback $14.99 HERE! Prime Shipping before Christmas! Kindle in pre-order. Releases directly to your Kindle device on December 18. I’m very fond of this book. And it’s just the beginning. Book 2 is only months away as the saga continues. It’s fun, it’s explosive, it’s unexpected, it’s a page-turner. This novel has been two years in the making and I’m thrilled with the result. I hope you’ll check it out. The Kindle version deal is a STEAL! The beginning of the end of the dark periods of modern history began on December 25, 1978, when a sure-footed, well-oiled, Vietnamese fighting machine crossed the border, heading straight towards the nearly deserted Cambodian capital of Phnom Penh. The ramifications and irony of such an invasion were lost on many people at that time, and even today, it’s a period of Southeast Asian history which few people know much about. Pol Pot, the enigmatic and dogmatic Communist leader of Cambodia, had created an illogical and frightening socialistic society. (We’ll have to deal with how he got there at another time.) His vision for Cambodia, inspired by Mao Zedong’s cultural revolution in China in the mid-1960s, was to create a completely agrarian society by removing every vestige of western, political, religious, and modern influences. This was cultural divergence on an unprecedented scale. Everyone was driven out of the cities and forced into labor camps, completed at the mercy of Anka, the all-knowing party. Kids were ripped away from their parents, taught to have allegiance only to Anka. And then the killing began. Elderly, educated, those with ties to Americans, those who spoke a foreign language, those who wore glasses, etc … The hit list was long and brutal. Different factions of the party couldn’t be trusted, and purge after purge began, spilling blood on an unimaginable scale – eventually to be known as The Killing Fields. Upwards of two million, nearly 1/3 of the entire population of Cambodia was caught up in the unrelenting killing. This was the time period from 1975 – 1978. But the Vietnamese did not cross the border on Christmas day in order to stop a humanitarian crisis. Something else had been brewing as well. Khmer Rouge leader Pol Pot turned his eyes towards southern Vietnam, claiming the entire delta as belonging to the Cambodian people. He severely resented the Vietnamese and ordered cross the border raids, slaughtering entire Vietnamese villages. The Vietnamese tried to bring international attention to these atrocities, but no one was interested and in fact hardly even believed them until a western journalist documented the case. Why were the Vietnamese being ignored? Much of the western world considered the communist Vietnamese government to be nothing more than a pariah, one who had reneged on the Paris Agreement on Vietnam, until they eventually overwhelmed the South Vietnam government in April 1975. The west had little interest in worrying about the border issues between two communist countries. It eventually began evident to the Vietnamese that if they wanted the Khmer Rouge to stop the attacks on the Vietnamese border, they would have to do it themselves. So they did, starting Christmas 1978. So forceful and effective was the Vietnamese fighting machine, that they rolled through the countryside, pushing into Phnom Penh and liberating much of the country from the Khmer Rouge in a matter of weeks. In a twist that is in hindsight quite ironic, the U.S. and other allies condemned the Vietnamese invasion, which, they thought, proved their point that the Vietnamese government was nothing more than a pariah state, wanting to conquer more lands. On the ground, however, the reception was very different. The Cambodian people welcomed the Vietnamese, thanking them for overthrowing the Khmer Rouge. Only after this invasion did word of the real extent of the Killing Fields begin to spread around the globe. Vietnam (unwisely) outlived their welcome in Cambodia, putting a pro-Vietnamese Cambodian government in power and leaving their troops in Cambodia for a decade, further alienating them from the rest of the world. The Cambodian people, dazed and desperate, began a long, long journey back to normality. For perspective, it took thirty years to have the first Khmer Rouge trial in Cambodia. It started in 2009. A whole generation of people were scarred beyond imagination – no family untouched. 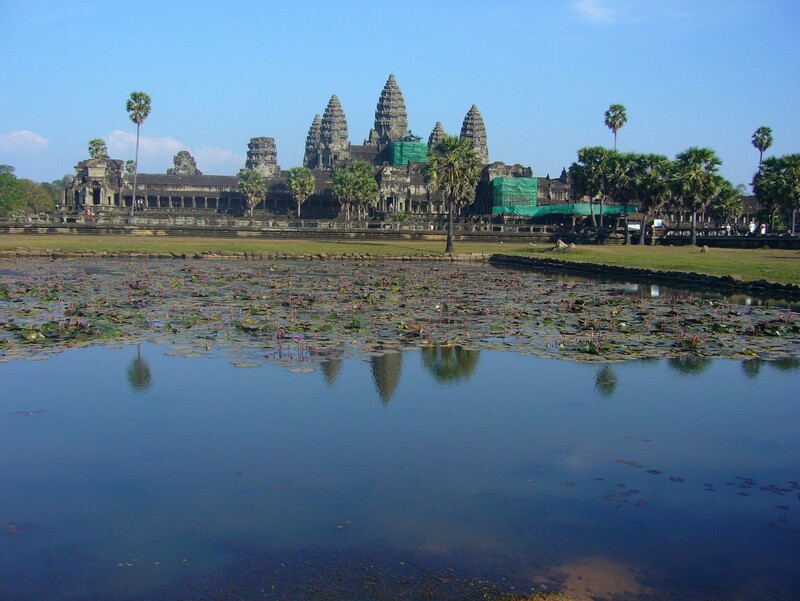 Siem Reap, in the northwestern corner of Cambodia, is the home of the ancient kingdom of Angkor, which dominated the region from the 9th to 13th century AD. It combines two things I love – Asia and history – making it one of my favorite places anywhere. At its peak, it had an agricultural and aqueduct system which feed an incredible one million people. 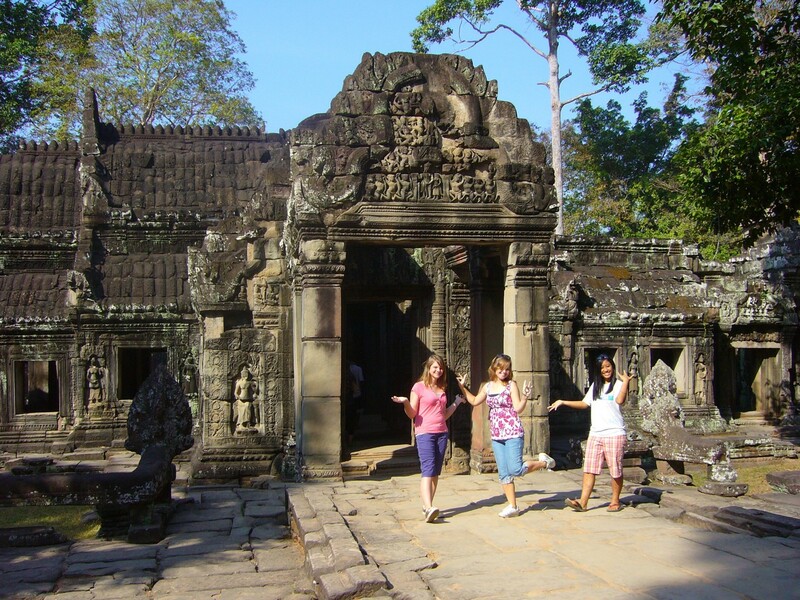 The temple ruins of Angkor are spread out over a huge stretch of land, each temple outdoing the other in grandeur and scope until you come upon the most famous of them all – Angkor Wat. This Khmer kingdom was Hindu in influence, not Buddhist. Hinduism was also one of its downfalls as more egalitarian religions came upon the scene supplanting it. 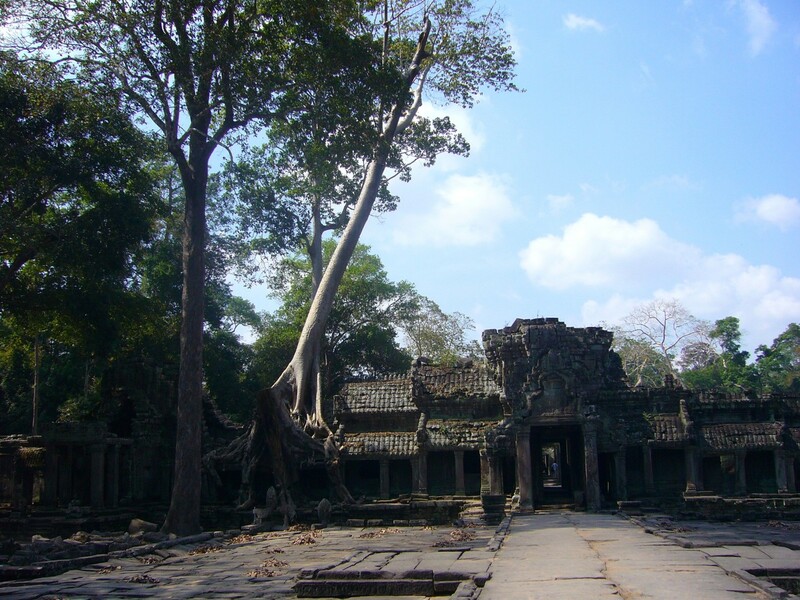 The ruins of Angkor had largely been forgotten to the world until a French explorer, Henri Mouhot, stumbbled upon it during an expedition in the 1860s. What a grand discovery it must have been – walking through the forsaken jungle to suddenly come across some of the most majestic ruins in the world. A day touring the ruins (see pictures below) is completely exhilarating and awe-inspiring. I even found the modern day town of Siem Reap to be quite charming with wonderful cafes and restaurants and an easy relaxing atmosphere to kick back and enjoy. It’s a place I want to return to. It’s a place I highly recommend to anyone on this side of the world. It truly is a must see. That’s why it is #3 on my Asia list. I was doing an author’s interview recently and the interviewer asked what is my favorite place in Asia. That made me really stop and think. I’ve been fortunate enough to have traveled to some pretty cool places throughout east and southeast Asia. So I decided to do my blog’s first 10 ten series. I’ve compiled my 10 most favorite places I’ve been to in Asia. Now, of course, a list like this is very subjective. So I do have a couple of rules. 1) This list includes only places that I have visited. Yes, there are a lot of great places not on the list which I simply haven’t been able to get to. So don’t be offended if your favorite place isn’t even mentioned. I probably haven’t been there. 2) Some of the places are more regional, and others more specific. I didn’t want to just say “My Top 10 Favorite Cities” because some of my favorite places aren’t necessarily in a city. 3) Some of these places I haven’t been to in years so my thoughts are based on my experiences whether recent or long ago. So with those ground rules, I’ll be posting my picks over the next few weeks. I’d appreciate your comments. Bangkok, Thailand – Bangkok is a sprawling, bustling city, that always feels extremely hot. The temples and palaces are beautiful and the food is great. But it wasn’t enough to crack my top 10. 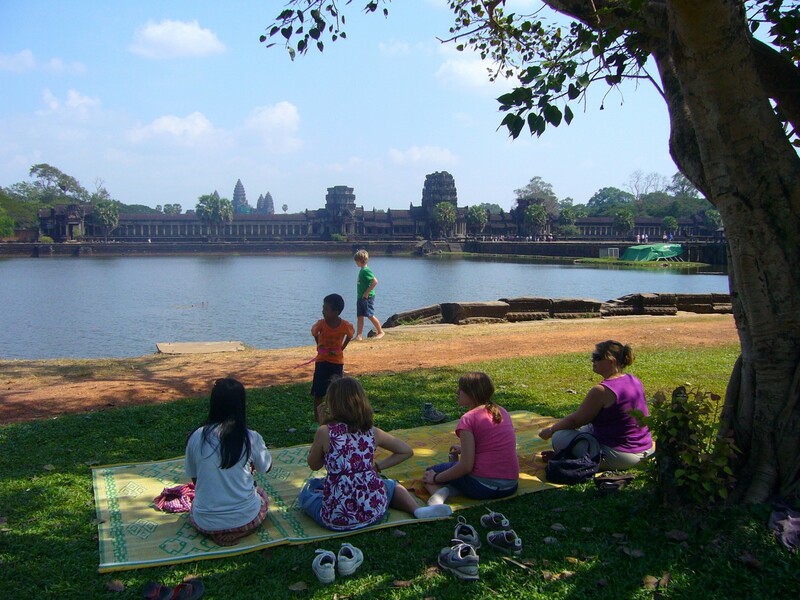 Vientiane, Laos – I remember driving through the capital for the first time and asking myself, ‘where’s the capital’? It’s an extremely laid back place. Very friendly people, but not a whole lot to do. Bali, Indonesia – Some will wonder how this one didn’t crack my top 10. The beaches are beautiful, yes. However, I was turned off by the crowds. Everything was so busy and chaotic. It wasn’t the relaxing beach destination that we were looking for. It is pretty, though. Phnom Penh, Cambodia – The capital of Cambodia is an interesting place to visit. A must are the relics which reveal the horror of the Killing Fields. The Cambodian people are fun and gracious. Tokyo, Japan – It was big, confusing, and really expensive. Kuala Lumpur, Malaysia – KL is an interesting city with some fun stuff to do. I always like stopping by the administrative capital of Putra Jaya to the south. But really, if you are going to Malaysia, there are more interesting places. central Vietnam – This one was hard to cut from my list because there are some really nice places to visit there. Hoi An, the ancient city, is quaint and pleasant. Danang has the wonderful China Beach, Hue, the former Imperial City, has some wonderful old palaces to visit. Come to think of it, how did this one not make the list? These ten ahead of it must be something special. 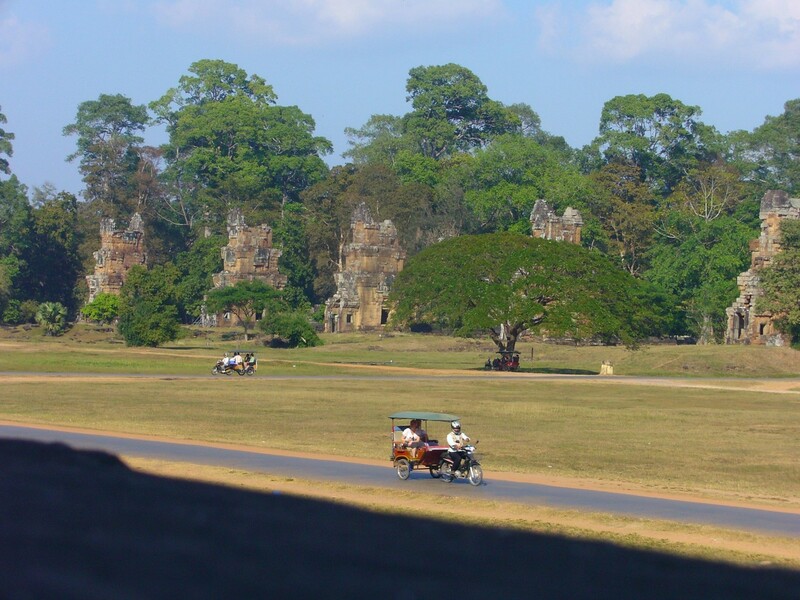 The great Kingdom of Angkor arose in the 10th century and lasted into the 14th century until it faded from regional consciousness, having the jungle wrapped the marvelous splendors of the era in its never ceasing grip. Why did the great kingdom fall? There were many reasons. Wars with the Siamese. Eroding aqueducts. The importance of the spice trade necessitating a move toward the coast. The rise of Buddhism. All of those contributed to the population base shifting away from northwestern Cambodia. 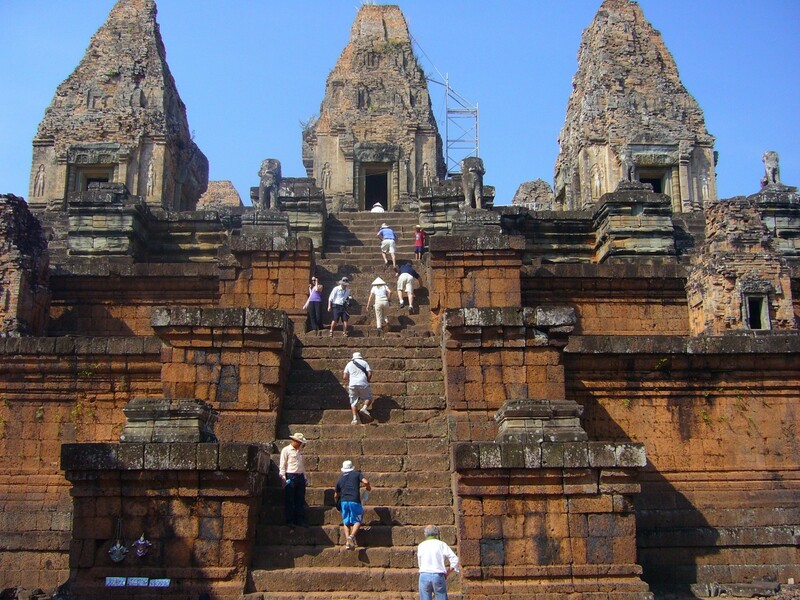 The modern day Siem Reap became lost to the ages – except to the small number of locals who continued on in the region. Fast forward to the latter half of the 19th century. The French had been capturing or influencing parts of Indochina including Tonkin, Annam, and Cochinchina – all three of which make up modern day Vietnam. They pushed westward into Cambodia and Laos – both extremely remote areas that the western world knew very little about. An explorer named Henri Mouhot was leading a trek up the Mekong River and through the remote jungle of northwestern Cambodia when he stumbled upon the massive ruins of the Kingdom of Angkor. Imagine the scene – walking through a primitive landscape to suddenly stumble upon ruins of epic proportion. Towering structures with intricate carvings. Temples constructed with incredibly complex technology to rival any of the wonders of the world. He had ‘discovered’ a civilization which was previously unknown to the west. The discoveries were staggering. One hundred and thirty-some years later, the discovery of the Kingdom of Angkor is still staggering. The temples, shrines, and structures are spread out over a huge area, each one seemingly bigger than the other. 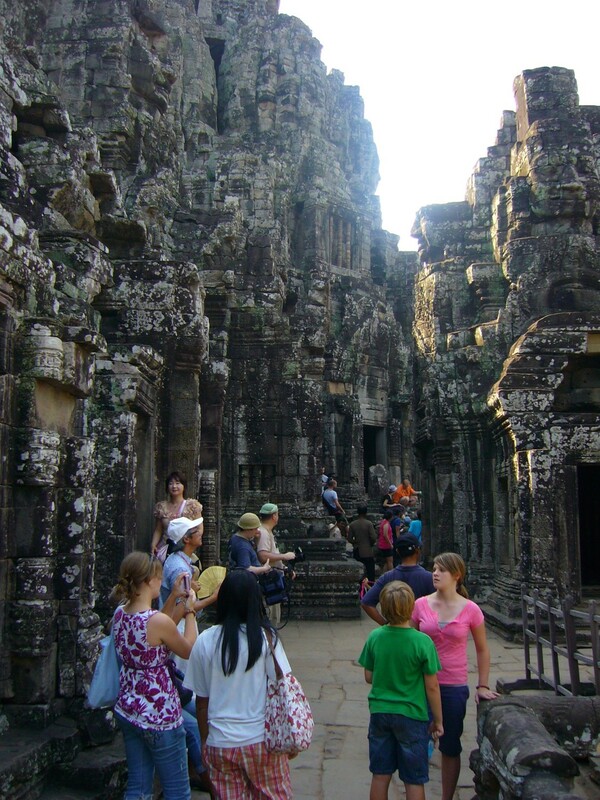 Angkor Thom and its massive stone pilings and passageways seems more like a surreal movie backdrop than a temple. You will stand in awe wondering how they built that in a place like this. And then, the granddaddy of them all – Angkor Wat – complete with moat, and surrounding gated wall that is impressive in itself. The famous reflecting poor which mirrors the spiraled stone steeples rising from the temple – the bathing pools – the stone carvings – all of it is awe-inspiring. It’s one of those must places to visit during your lifestyle. Come discover for yourself what the Frenchmen couldn’t believe. You’ll feel the same way.